A few months ago, I received in my church office the “latest and greatest” in the Deaf World – a videophone by Sorenson Video Relay Service. I don’t know the technological specifics of how it works, but I can tell you that it works great with communicating with people whose first language is Sign Language. Plus, it didn’t cost a cent to get the videophone. The only cost to the church is the maintenance of a direct service line, which was covered by a gracious gift from the Lovers Lane United Methodist Men. 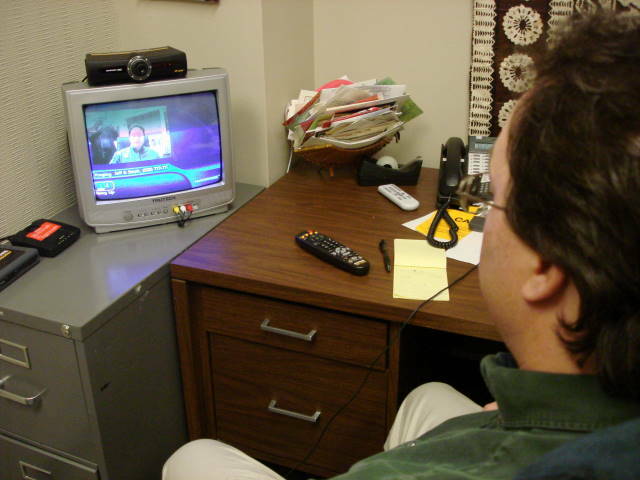 The way a videophone works is that there’s a camera on top of a TV. monitor, also free from Sorenson. The Sorenson folks took care of connecting the cables and teaching me how to make a call. The first person I called was my father – he’s hearing but I wanted to try out using a video relay operator. Using my remote, I clicked on the video relay icon for the interpreter and in seconds a living interpreter showed up on my TV. monitor. There were two windows on the screen – one of the interpreter, and the other of me. If I don’t see myself on the screen, then the interpreter can’t see me on his or her screen. A few days later, I got a video phone call from one of our Lovers Lane Deaf members in Prescott, Arizona. This time we didn’t have a video relay operator – we signed direct to each other. I saw his wife and child and I caught their body language, facial expressions – everything was clear and understood. Plus, it didn’t cost anything for the call – all videophone calls are free. In the past, I would have had to use a TDD (telephone device for the deaf), which displays text on a key board. I would type my words to the other person. But my words would not convey the tone of my voice, showing a tease or deep concern. With a videophone, the same nuances expressed in voice tones can be read on our faces and hands. Using a videophone makes communicating in American Sign Language a snap! Making our churches accessible to those who are Deaf and communicate in ASL is a much needed goal. With minimum expense, churches should get a videophone and advertise that number in the community. Who knows? The next call just might be from a family who has a deaf parent or child. Telling them that you have a videophone number will send a positive message that your church cares about Deaf people. For more information go to www.sorensonvrs.com.